This is one of those ideas that's either incredibly brilliant, or incredibly lame. 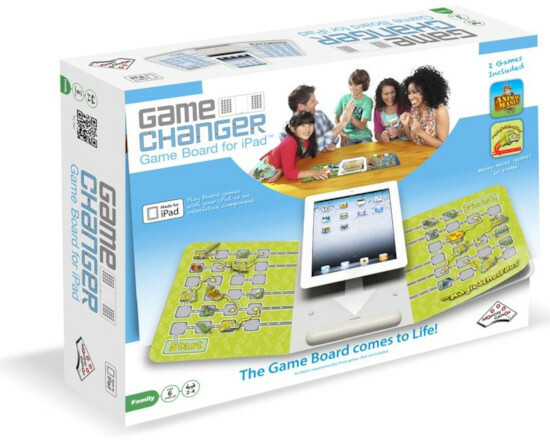 The product is called The GameChanger, and it turns your iPad into a board game – potentially, an almost endless variety of board games. 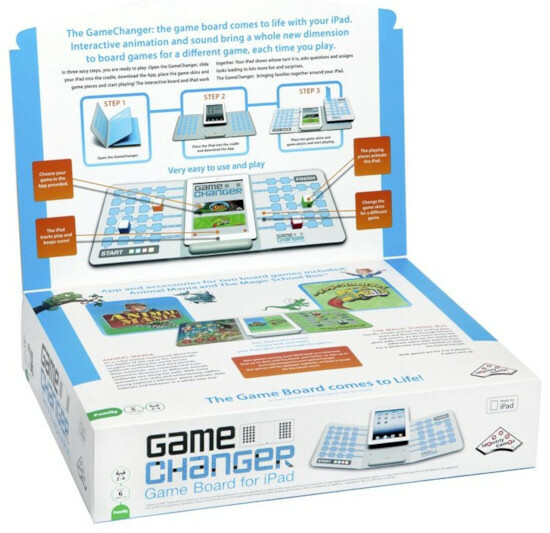 As you can see from the box shots, the product consists of a fold-up game board into which you slide your iPad, an app that you run on your iPad, four electronic game pieces, and "skins" that transform the board into various games. Animal Mania – "Travel from the depths of the sea to the wilds of the jungle, meeting mammals, sea creatures, and even prehistoric dinosaurs, with the Animal Mania game. With trivia questions, fun tasks, and entertaining riddles, young and old alike will learn about animals and their habitats and behaviors in a whole new way." The Magic School Bus – "Join Ms. Frizzle and her class on a learning adventure with Scholastic's The Magic School Bus game. Explore space, imagine traveling through the human body, and learn about the geology of Planet Earth. This board game comes to life with videos of the award-winning animated series, interactive trivia, and educational mini-games." The brilliance of The GameChanger is pretty obvious – this is a seriously cool idea with nearly endless possibilities. But it's also a bit worrying for those of us who appreciate the tactile pleases of a "real" board game – the roll of the dice, the swish of the cards, the snap of pawns on a board – as well as the feel (and smell) of quality components, lovingly designed and crafted "art" that you can enjoy each time you play. Converting all that to a purely electronic form would seem to eliminate much of the charm of board games. And, of course, for those without iPads, it's a substantial investment. How do you feel about "The GameChanger"? Learn more about The GameChanger.